For those of you not familiar with the company Anthropics, they are the ones behind the very successful Portrait Pro plug-in for Adobe Photoshop. PortraitPro Body is one of their latest plug-ins, made to basically make your male or female subjects look slimmer or more muscular. Many of the face/skin retouching features of the face retouching plug-in Portrait Pro 17 are also available in this plug-in, making it a one stop retouching solution. Amazingly, most of these processes are fully or at leat semi automated and actually look very realistic. We’ll have a look at all the features/functions in this run-through. I’ve been using Portrait Pro since the very first version, and PortraitPro Body 3 has improved massively since then in terms of speed and usability. In version 2 for instance, it was still necessary to manually draw the skeleton and figure outline.Now however, this is all automated. 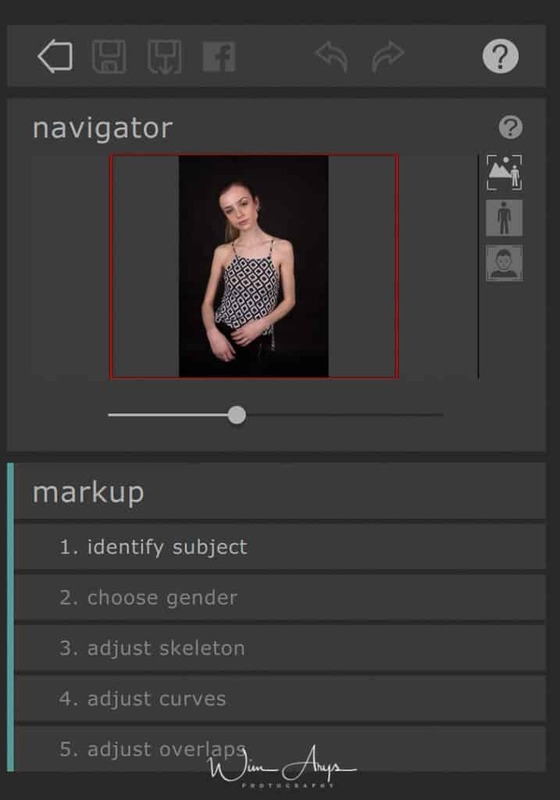 You only need to click on the nose, select gender, and the software will automatically find the face, body and the curves. It’s of course possible to edit these curves, and at times it’s still necessary especially with difficult poses, but it’s definitely a major improvement and time saver over previous versions. You’ll notice the navigator on the right of the interface that will tick all the boxes of your markup progress. 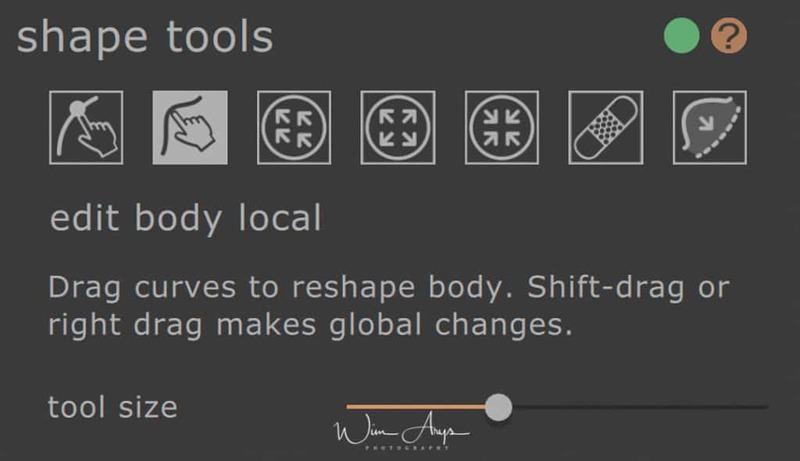 Once you’ve accepted or edited the body, you’ll automatically go to the shape sliders menu. You’ll find a main window where basic adjustments like slimming, curve, lift and make taller can be easily done via the use of sliders. There is also the possibility to go for a deeper edit of each body zone from torso through arms, legs and full skeleton. Each body zone has their own sliders, so there are a lot of possibilities in terms of tweaking the size and shape of arms, legs belly etc. In my example, I’m actually making this model a little more curvy instead of slimming her. So yes this is of course a possibility too. Once you’re pleased with the overall look of your model’s body, you’ll go to the shape tools menu. 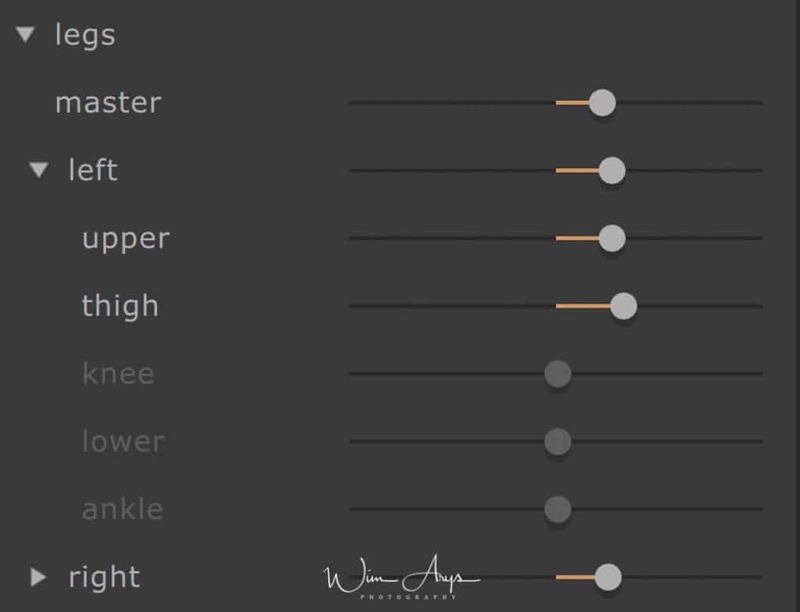 Edit Body: when this is selected, you can drag the outlines (or curves as they are called) to reshape the body. Pressing the Shift Button while dragging only makes local changes. Drag: Click and drag to warp a specific region. You can change the size and strength of your pencil. If you’re familiar with photoshop, you’ll quickly get the hang of this function. And in case you’re wondering, yes PortraitPro Body 3 is in some ways similar to the Photoshop Liquify function. it’s easiest to see Photoshop Liquify as the little brother of this suite. Contract: click and hold using the pencil to contract your selection. Press shift and click to contract. Again pencil size and strength are selectable. Repair: click and hold to repair tears between two regions; This tool needs some work, I’ve had limited success using it. Fix Bulges and Pinches: Move over any small bulges or pinches and click and hold to warp the red line towards the blue line. This tool needs some practice but it’s very useful to correct these problems. As I mentioned earlier, Portraitpro Body 3 can be seen as a one-stop beauty retouching application. Besidesadjusting your model’s figure, you can also smooth skin and even do things like changing the size of the belly button. The body skin will be automatically selected for you. You can off course add or remove the skin area. There are also brushes to smooth out skin, remove blemishes and brighten/darken (dodge/burn) skin areas. There is a general smooth skin slider too that works great and is I mentioned before you can do a virtual tummy tuck here as well as change the size (and type!) of belly button. The next step is the face menu, where the software will automatically detect the skin, eyes, lips and outline. The range of options here is not as advanced as what you’d get in Portrait Pro 17, but the basic set of tools is here. 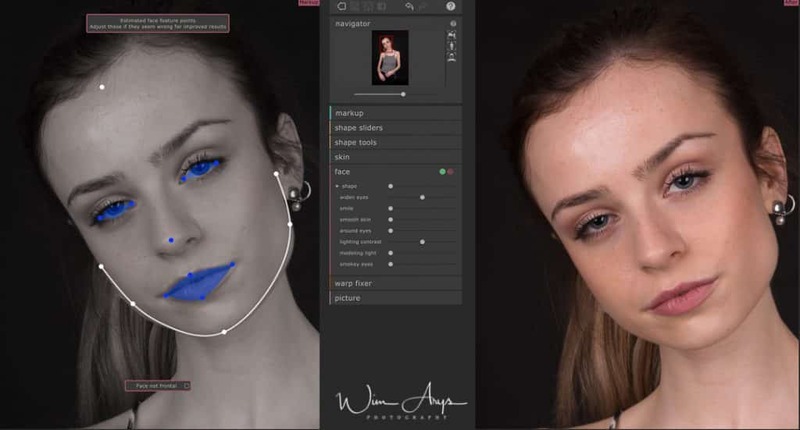 It’s possible to change the shape of the face, widen the eyes, add a smile, smooth the skin, remove dark circles around the eyes, add a bit of contrast, add a modelling light and even some of the make-up functionality is here with the smokey eyes slider. I often think it’s easy to overdo the beautification process in PortraitPro 17, so I’m actually quite happy with what is on offer here in terms of face retouching tools. You won’t need the warp fixer menu as much for studio shots, but once you start editing outdoors shots, with straight lines in your frame, you’ll notice that these will get bent by this stage. This of course is a byproduct of the edits to your model’s curves, and these can be corrected here. 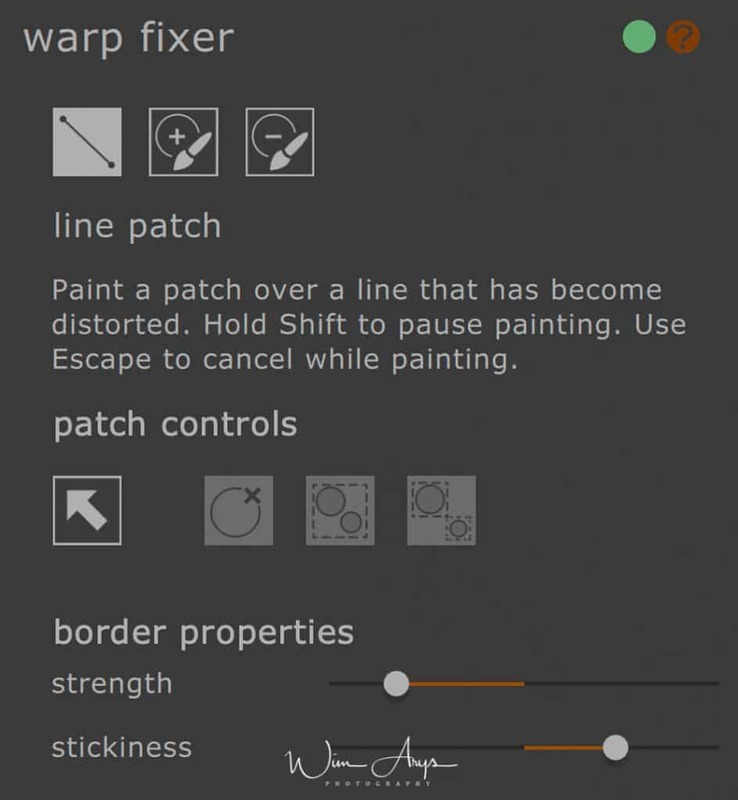 You can paint a patch over a line that has become distorted using this tool and the application will restore this to a straight line again. You can use a brush to reduce or expand these patches for an optimal result. Once you’ve run through all these steps, you’ll end up in the picture menu. You don’t really need to use PortraitPro Body as a plug-in from photoshop as all the ‘basic’ functionality of say Adobe Lightroom or Camera Raw is also available here. Directly importing RAW is no problem, and you can make basic changes to exposure, white balance, contrast, vibrance and saturation right here. It’s even possible to convert your image to black and white or sepia. It’s basic, but it’s here if you feel it would improve your retouching workflow. Portraitpro Body 3 has some interesting enhancements and improvements over previous versions. 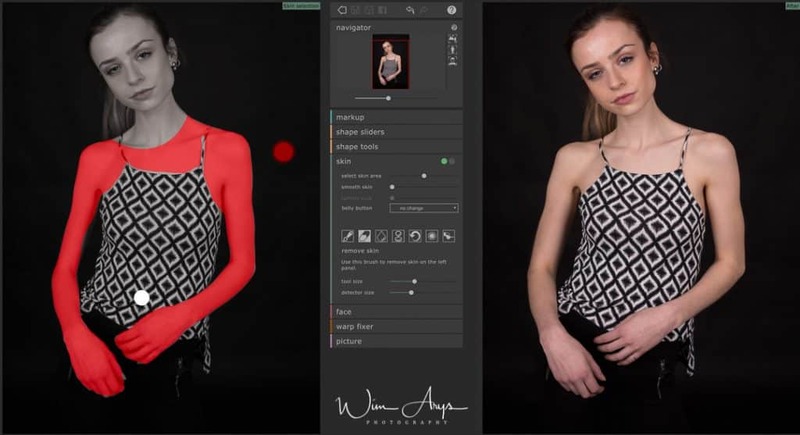 If you’re the type of photographer or retoucher that is looking for an easy and convenient way to slim or reshape people in your photos, Portraitpro Body is the application for you. 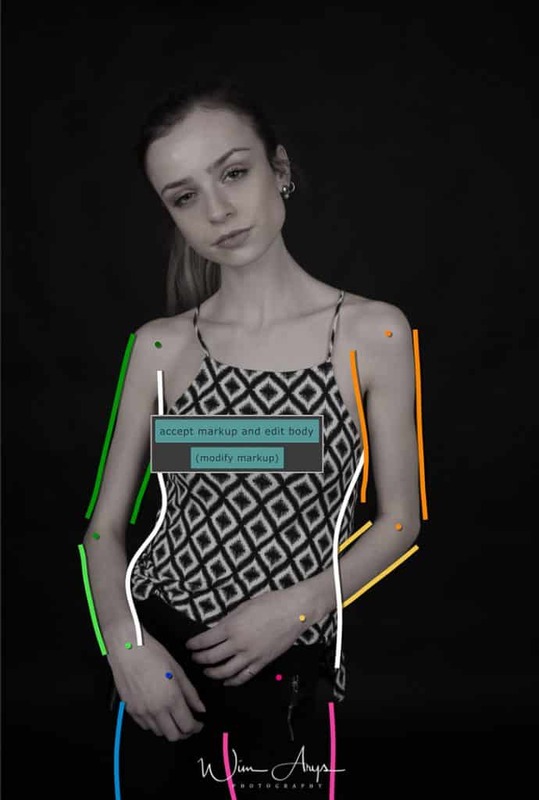 This interesting piece of software from Anthropics allows you to make adjustments to a person’s body shape and face features, not unlike the Liquify feature in Photoshop. The main difference is that Portraitpro Body is more advanced and that you have more control over how the reshaping is done. There are also tools available to correct mistakes in geometric objects that might occur as a side effect of this reshaping of body contours as well as advanced portrait retouching tools. Not that Portraitpro 17 is now obsolete, but for basic beauty retouching you’ll have all the tools you need. If you’re a version 1 or 2 owner, there is indeed a good reason to upgrade and that is the fact that the skeleton and contour settings of your individual model is now completely automated. This will save you a lot of time if you have a batch of images to process. Many other features also feel more polished and enhanced. Are there any negatives? Sure, I you are using PortraitPro body 3 as a plugin you’ll still need to import and export your images to and from the application. Some tools like the edit curve feature seem a little bit buggy, even on my 2017 iMac. But I’m sure that will be fixed in a future update. I’m not a reviewer who is positive about every piece of software, but if you’re looking for an excellent tool to reshape the contours of your model photography, Portraitpro Body definitely deserves your attention.